Frying pans from the WMF assortment are not just excellent at frying food but with the high quality handles are also easy to hold. The different frying pans from the WMF assortment are manufactured differently depending on the collection. A number of models have handles made from special high-quality WMF plastic as well as those with hollow handles made from Cromargan®. The black handles look good and can be used on both gas and electric cookers thanks to their special flame protection. As well as being made from heat-resistant material, the handles fit well in your hand, and thanks to their ergonomic shape and special surface texture ensure that a greasy pan won't slip through your fingers. The stable connection with the body of the pan using a tried-and-tested screw system means you can safely carry even completely full pans and quickly remove them from the hob. As stable as frying pans and their handles are, accident can still happen, even with our high-quality cookware. If your WMF pan handle is damaged then you can find a replacement in our Spare parts and Accessories category. You can find handles that are similar to the original, for example for coated frying pans with the CeraDur® non-stick coating or for frying pans from the Comfort collection. Frying pans that are suitable for induction hobs are also compatible with our replacement handles depending on the model. Replacing the pan handle is as easy as pie thanks to the time-tested screw system between the handle and the body of the pan. The damaged handle is loosened using a screwdriver and the new one is screwed on the same way. The new part fits exactly onto the frying pan thanks to our careful and quality-focused production process, and you are ready to carry on frying and boiling.  In the section for WMF cookware accessories and other products in our shop you will find the spare parts you want as well as the accessories in their respective categories. As well as pan handles you can also find lid handles or lids for pots and pans there, as well as stewing inserts and steaming inserts. If you should suffer any minor mishaps in the kitchen your pots and pans will be reusable again in no time, as any missing accessories can be ordered from our shop quickly and simply to ensure a better cooking experience. We hope you have fun with our cookware!